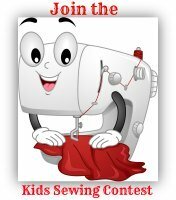 Our goal here at Kids Sewing Projects is to establish a website with free information, tutorials and easy lessons for kids to learn how to sew. 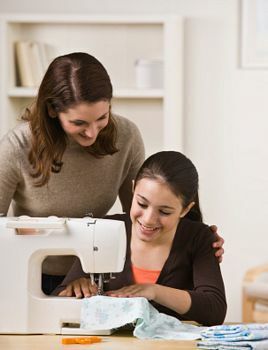 Once kids get to handle their own sewing machine it is like a whole new world opens up to them. Even young kids can do sewing activities and a 7-8 year old is old enough to learn how to sew on a machine. Throughout the world clubs and classes are becoming more popular than ever before to teach kids to sew. Here is a secret about teaching kids to sew! Doing one project big or small will not teach children to sew. It might even have the opposite effect if you pick one Big activity. You and your kids could be screaming with frustration and never want to look at a machine or needle again. The idea of our website is to have fun stitching up multiple projects. Small at first then building on that knowledge as your child learns. With our easy sew projects for kids, your kids will learn step by step, slow and steady, to build their foundation of expertise. We've included instructions with photos with each online sewing pattern or tutorial. The important thing about learning how to sew is you have to have your hands involved in the work. Just like cooking you can't pick up a cookbook and automatically know how to cook. You can't read a "how to sew" book and know how to sew. You need a hands on, involved experience, especially with kids. Learning, trying, growing and hands on are what this website is about. Before you get started on some of our kids sewing projects collect your basic supplies and check out your level. 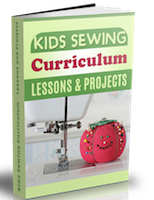 You are welcome to use our lessons and tutorials as a sewing curriculum. Remember boys and girls can both sew. We have lots of ideas for girl projects in our kids projects index. Here are more ideas for boys sewing projects. "I started a girls mentoring class 2 months ago. We have lots of activities to cover in our curriculum. One of these is basic home economics. I wish to get interesting ideas in order to achieve maximum output in mending and sewing. These are girls aged between 6 and 13. I believe you are my solution to my problem. "I want to teach my 7 year old niece how to sew. 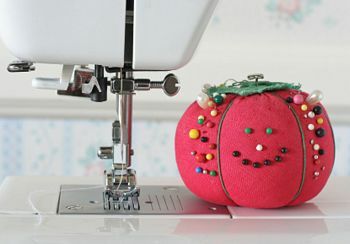 I've been looking for a website that I can use as a reference and that includes some basic kids sewing projects. Your site is terrific!" We have a Kids Sewing Club that goes out weekly with tips on teaching kids sewing and sewing projects.